Ms. Klein received her bachelor of science degree from Union College in Schenectady, NY. She was awarded her graduate degree in physician assistant studies from Pace University. 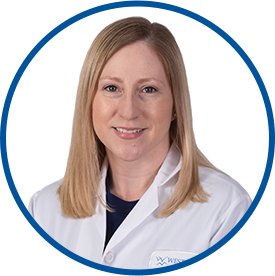 Before joining Westmed, she was a physician assistant at Westchester Heart and Vascular and at New York Allergy and Sinus Centers. She is certified by the National Commission on Certification of Certified Physician Assistants (NCCPA). *Mrs. Klein is caring, knowledgeable, takes her time with me & gave me excellent care!! She was great about everything. Took her time to explain to me. Very good experience. She was excellent. *Vicki Klein is a jewel. She is the BEST!!! Always have a positive experience -- all my questions or concerns are always addressed. Vicky is a caring, considerate professional and I have all the confidence in the world in her abilities. I am beyond pleased with my care at WestMed. I am an MD and generally do not go to mid level providers. Vicki is an exception--she is very good, knowledgeable about basic treatment, pleasant to work with. *Vicki Klein was professional, friendly, answered my questions/concerns. She was covering for the other doctors yet she took her time with each patient. Vicki Klein is first rate.